The field studies allow a small group (limit 20 for each field study) to experience a longer, more in-depth herb walk. Open only to participants registered for the Southwest Conference. Carpooling arrangements can be made in advance by emailing us. Sign up early for a field study–this is an experience not to be missed! Details below. 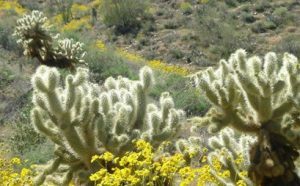 Spend an Arizona spring morning in the Superstition Wilderness Area with Phyllis Hogan, discovering an unexpected abundance of plant diversity within this precious corner of the Sonoran Desert. Walk the First Water Trail, remembering water here is sacred, ephemeral, and with it comes life. Step onto the Garden Valley and search for and find the Blue Star. Learn medicinal and cultural uses of the plants found in this unique area. Gaze at the expanse and depth of the Superstition Mountain Range. Breathe deeply, and take home the knowledge learned, the trails walked, the time shared, and the plants discovered. 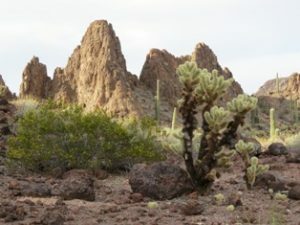 The Superstition Wilderness Area was designated in 1939 and expanded to its present size of approximately 160,000 acres in 1984.It is home to an amazingly diverse population of medicinal plants and features unique rock formations and miles of trails. Phyllis Hogan has been a practicing Southwest herbalist for 25 years. She is the proprietor of the Winter Sun Trading Company, located in Flagstaff, Arizona, USA established in 1976. Winter Sun specializes in traditional organic southwest herbs and tinctures and American Indian Art, focusing on the Hopi and Navajo of northern Arizona. In 1983 she co-founded the Arizona Ethnobotanical Research Association (AERA), a 501(c)(3) private nonprofit educational and scientific organization. The AERA was organized to investigate, document, and preserve traditional plant use in Arizona and the greater southwest. The AERA was recently awarded recognition by the American Herbalist guild at their 14th annual symposium for outstanding contributions in the field of American ethnobotany. Hogan has lectured on southwest herbal medicines and their traditional uses throughout the United States and in Finland. She has taught ethnobotany in bilingual education programs and health education for the Pima, Hualapai, Havasupai, Hopi, and Navajo tribes. She is the coordinator of the AERA’s annual educational symposium and senior editor of the yearly AERA ethnobotanical journal and newsletter The Plant Ambassador. 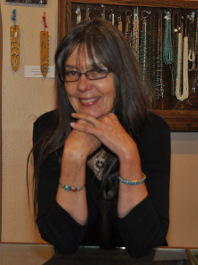 Hogan is currently Practitioner Associate in the Anthropology Department at Northern Arizona University and Adjunct Professor in Biology at Northern Arizona University. Phyllis is also a board member of the nonprofit Tucson based heritage seed conservation organization Native Seed Search founded in 1983. 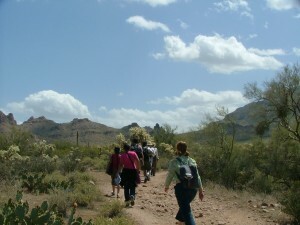 Mimi will also take her group to the beautiful Superstition Wilderness near Lost Dutchman State Park, a sacred spot for relaxed attunement to the healing magic of the desert. Explore uses of the plants and their flower essences, sample tea and food plants, and demonstrate some first aid preparations. 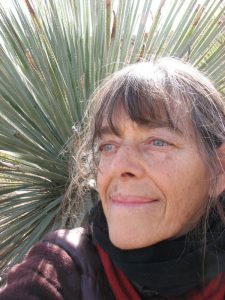 Mimi Kamp has been working with plants in the Southwest and Sonora for over 40 years – as artist, botanist, wild-crafter/medicine-maker/herbalist, teacher, gardener, and flower essence researcher/practitioner. She emphasizes habitat and regionally sustainable plant medicine, landscaping with native medicinals, and cultivation of effective medicines from elsewhere which can enjoy the desert climate. Seeking to expand awareness of herbs unused or underused in western herbal practice, local medicines with so little written history, she invites students to experience our plant friends through a wide range of inquiry – from chemistry to spirit. Online and phone registration is now closed. Register at the door. Throughout time, herbalists’ training has begun by developing relationship with the plants that grow around them. This involved long hours of observation and contemplation with guidance from experienced elders, often beginning at a very young age. Now, most, if not all of our training is derived from books, lectures, scientific studies, and video trainings with very little knowledge being passed from plant-to-person, our original, and primary, or foundational, mode of learning about plants. 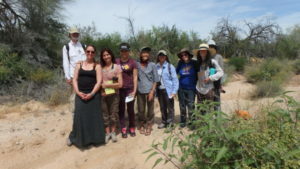 Join bioregional herbalist, John Slattery, for a walk through a diverse Sonoran desert landscape where multiple habitats converge as we explore the various modes of gathering knowledge about plants as medicine. We’ll focus on direct observation of plants, and receptivity to transmission of knowledge and healing from plants, which can be referred to as experiencing the Nature of plants. John has been honing these exercises and this approach to working with wild plants for well over a decade. The material is deep and powerful, yet accessible to any and all who put their awareness into receptivity from the plants. We’ll also explore all the aspects of becoming a bioregional herbalist through experience, knowledge sharing, and exploration. John Slattery is a bioregional herbalist helping people develop relationship with wild plants. He founded Desert Tortoise Botanicals in 2005 which offers wildharvested plant medicines to the people of the Southwest. 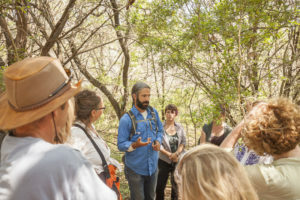 He maintains a clinical practice in Tucson, AZ and offers plant walks, foraging expeditions, field trips into Sonora, Mexico, and his annual Sonoran Herbalist Apprenticeship Program. For more information on the Southwest Conference on Botanical Medicine please read more here.